Artificial vertical gardens and fake green walls have continued to grow in popularity; with a need to save time, money and add style to indoor and outdoor spaces.s. Designer Plants are leading this trend with a new range of vertical gardens that go beyond the usual standards. How have artificial plants improved? Years ago people would only be able to choose between tacky plastic plants and artificial plants that were slightly off when it came to colour and style. With the development of new technologies, faux plants have significantly enhanced, with many now being confused for “real plants”. Many customers were open to artificial greenery and fake plants, but a key problem was that they would crack and fade within a matter of months. With this in mind, Designer Plants was one of the first Australian fake plant providers to provide advanced UV resistant hedges and plants. Still today this technology in greenery is not standard practice. And many suppliers in the market declare they have UV protection based on a spray being applied to their product. The reality is like anything you apply to an item over time, this wears off. How is Designer Plants green range UV protected? 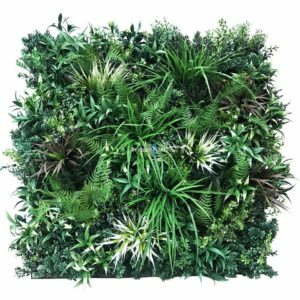 Designer Plants offer a range of UV Engineered Green Walls that not only look great but have undergone a significantly different UV protection process. To ensure longevity, UV protectants are applied into the plastic during moulding. This ensures that the protection is within the plastic and does not wash off. 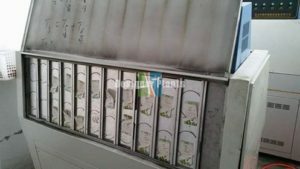 The plants then undergo testing for hundreds of hours, being subjected to harsh water blasting, UV light testing, and sandblasting. Here is a photo of the greenery undergoing testing. What’s next for vertical gardens? Many architects, home designers, landscapers, and homeowners want to see more variety when it comes to vertical gardens and green walls. The next generation of high quality greenery has been introduced. 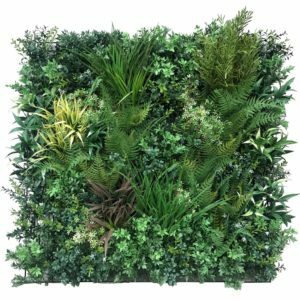 This new range of hand assembled green walls are unique in that they have hundreds of artificial plant stems attached on a mesh sheet which can be easily mounted or placed on a wall. The result? A green wall that is full of style with a touch of colour that can be applied to beautify any indoor or outdoor space. Not only have these individual plants been UV engineered, but this next generation of fake plants has gone one step further with fire retardant applied to them. 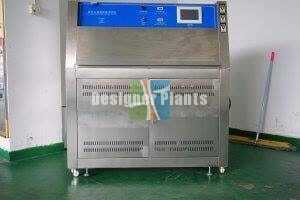 This helps to reduce and slow the rate that they would melt if subjected to flame or significant heat. Obviously, plastic melts, however, this will help the plants become an item that is self-extinguishable. This means that they are stronger when it comes to conditions where the plant may be exposed to extreme heat. It’s important to still obtain independent professional advice as to the suitability of the product for your building or home. And then choose from one of the many artificial stems here to add more colour or depth to your green wall. ← What fence should I choose for my home?